The use of lipid biomarkers for the early diagnosis of pancreatic cancer, the development of technology to reduce paracetamol toxicity, the use of advanced magnetically active nanomaterials based on titanium dioxide for the preparation of bioactive substances, a portable audiometer - the results of these and other research projects of the University of Pardubice now have a better chance of being put into practice. The school is the first in the Czech Republic to join the SPARK Global Program at Stanford University, California, helping with the transfer of technology into practice. The SPARK Program can boast that up to sixty percent of supported projects find use in clinical practice. The key to success is the intense interaction between scientists and industry advisers. Representatives of the University of Pardubice already received feedback from their American colleagues during the initial talks. "We were negotiating not only with the founder of the program Daria Mochly-Rosen, but also with Peter Santa Maria, an ORL specialist at Stanford University Medical Centre, who has developed a new drug for the therapy of chronic tympanic membrane perforations with the help of the SPARK Program. He patented this technology and then set up a start-up company. The technology has recently been licensed to Astellas Pharma, a large pharmaceutical company that has launched clinical trials on patients," said Michal Svoboda, director of the Centre for Technology and Knowledge Transfer (CTTZ) of the University of Pardubice. "We have received valuable feedback from our pharmaceutical practitioners who work at Stanford University for our research into drug toxicity. The discussion was irreplaceable for the further direction of our research, " adds Tomáš Roušar of the Department of Biological and Biochemical Sciences, the Faculty of Chemical Technology, who deals with the research into paracetamol toxicity and the development of a new combined drug that is expected to have a demonstrably lower toxicity compared to the available competitors. Researchers and PhD students at University of Pardubice will now have the opportunity to learn about the transfer of biomedical technologies and medical devices through specialized lectures and seminars and, for example, to attend a two-week educational programme at the annual SPARK Global Meeting. Following the Stanford University's model, a network of practitioners will be gradually built up at the Czech university to consult scientists' projects and help guide the research. At the same time, a network of contacts will be established for important companies - potential commercial partners in the field. "Transfer of patents into practice can be a complicated, long-term and costly process. I very much welcome our participation in this programme. I also appreciate the possible involvement of PhD students who it can help expand their horizons and enable them to be better versed in the interconnection of the academic and industrial spheres, which is an area where the Czech Republic needs a significant improvement," adds Michal Holčapek of the Department of Analytical Chemistry, the Faculty of Chemical Technology, whose team has developed a unique diagnostic method for the detection of pancreatic cancer based on lipid analysis by mass spectrometry. 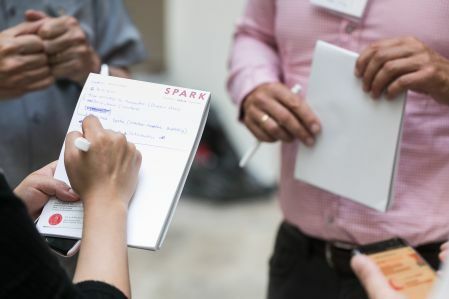 The first annual two-day SPARK Global Meeting was attended by Pardubice representatives in July in Berlin. In the section of new and planned programmes, attention was drawn to both the University's results in the area of biomedical and related research and the programme implementation plan under the conditions of the University of Pardubice. Amongst other things, meetings of six permanent working groups were held to create a database for the interconnection of individual programmes and a subsequent presentation thereof to industrial partners and investors; relations with industry and SPARK network marketing; projects to tackle rare diseases or outbreaks such as zika or dengue; education in the field of drug development, diagnostic methods and medical devices; funding of national programmes and global networks; regulatory affairs.